Faculty and students from the Department of Art and Art History collaboratively activate the gallery, reimagining conventional exhibition practices. The Interdisciplinary Arts students presented a performative drawing, creating a collaborative artwork in response to the historical piece “Two Stage Transfer Drawing” by artist Dennis Oppenheim. Join the Museum of Art for quiet study. Snacks and beverages will be provided. The exhibition “Kal Spelletich: Significance Machines and Purposeful Robots,” combines art and mysticism with the rigors of science and technology to explore the power of prayer and other meditative practices. Kal Spelletich has been exploring the interface of humans and robots, using technology to put people back in touch with real-life experiences. Participants can operate the robots by touching an interface sensor that enables the machine to ‘read’ the viewer and react with a responsive gesture. By calming their fears and focusing their attention, participants can utilize techniques comparable to meditative practices to operate interactive sculptures with the possibility of performing their task with more precision and skill. Kal Spelletich was born and raised in Davenport, Iowa. He received his BFA from the University of Iowa, and MFA from The University of Texas at Austin, both in the field of Media Art. He has performed, exhibited and lectured worldwide, collaborating with scientists, musicians, and politicians including Namibia, India, Netherlands, Switzerland, Germany, Croatia, France, Czech Republic, England, Slovakia, and Austria. Most recently, he was a resident artist at Recology SF and built artificial organs during a residency at Stochastic Labs, Berkeley, California. Spelletich’s work has been included in numerous exhibitions over the past three decades including the De Young Museum, San Francisco, California; San Francisco Museum of Modern Art, San Francisco, California; Exploratorium, San Francisco, California; Yerba Buena Center for the Arts, San Francisco, California; and the Headlands Center for the Arts, Sausalito, California. Spelletich lives and works in San Francisco, California and is represented by Catharine Clark Gallery. A series of public programs and a publication accompany the exhibition with essays by Anuradha Vikram and Tanya Zimbardo. Kal Spelletich: Significance Machines and Purposeful robots is organized by Saint Mary’s College Museum of Art curator, April Bojorquez. 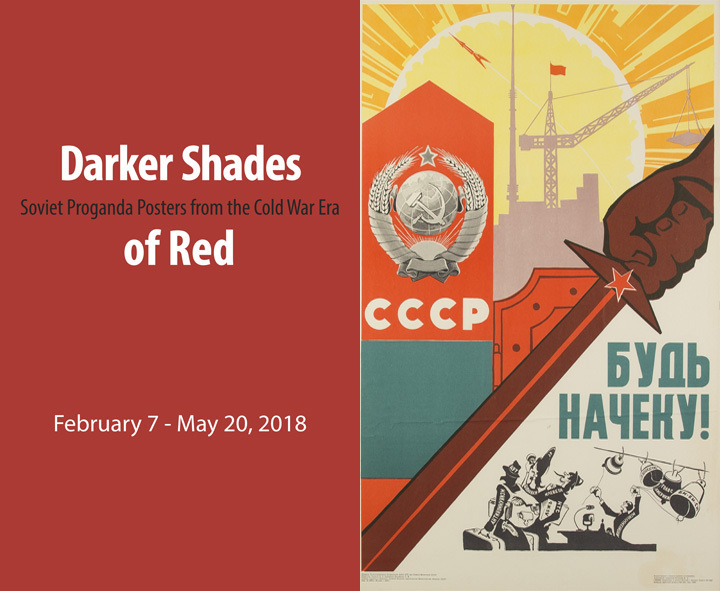 Darker Shades of Red: Soviet Propaganda Posters from the Cold War Era, Provides a rare opportunity to revisit the Cold War era through the exploration of the Soviet Union’s official imagery. Strikingly graphic in its socialist imagery, the collection of 55 posters reveals the economic, social and political ideology of the Soviet Union from the 1940s to 1991. The works on exhibit are drawn from the private collection of Gary Hollingsworth, a Florida based art restorer who traveled extensively in the former Soviet Union. Please join the Museum of Art for an opening reception on Thursday, February 8. Wednesday, February 28 at 1:00 - Professor Susan Weissman: "The First Socialist Revolution." Wednesday, March 21 at 1:00 - Professor Scott Schonfeldt-Aultman and Alex U. Inn: "Pursuing Social Justice through Drag." Wednesday, May 2 at 1:00 - Professor Dan Leopard: "Comrade Tintin: Herge and Stalin in the Land of the Soviets."